شمسی پور, علی, حجتیان, فرزاد. (1397). بررسی ریزساختار و خواص مکانیکی لایه کامپوزیتی Al/AlN تشکیل شده روی آلومینیم بصورت درجا توسط فرآیند همزن اصطکاکی در حضور گاز نیتروژن. نشریه علوم و مهندسی سطح, 14(38), 69-78. علی شمسی پور; فرزاد حجتیان. "بررسی ریزساختار و خواص مکانیکی لایه کامپوزیتی Al/AlN تشکیل شده روی آلومینیم بصورت درجا توسط فرآیند همزن اصطکاکی در حضور گاز نیتروژن". 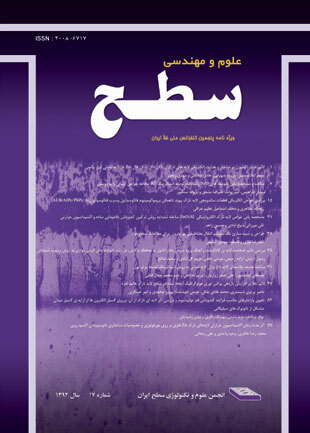 نشریه علوم و مهندسی سطح, 14, 38, 1397, 69-78. شمسی پور, علی, حجتیان, فرزاد. (1397). 'بررسی ریزساختار و خواص مکانیکی لایه کامپوزیتی Al/AlN تشکیل شده روی آلومینیم بصورت درجا توسط فرآیند همزن اصطکاکی در حضور گاز نیتروژن', نشریه علوم و مهندسی سطح, 14(38), pp. 69-78. شمسی پور, علی, حجتیان, فرزاد. بررسی ریزساختار و خواص مکانیکی لایه کامپوزیتی Al/AlN تشکیل شده روی آلومینیم بصورت درجا توسط فرآیند همزن اصطکاکی در حضور گاز نیتروژن. نشریه علوم و مهندسی سطح, 1397; 14(38): 69-78. برای اولین بار از گاز نیتروژن در فرآیند همزن اصطکاکی(FSP) برای ایجاد لایه سطحی کامپوزیت Al/AlN روی فلز آلومینیم استفاده شد. بررسی ریزساختار لایه‌ها توسط پراش پرتو ایکس، میکروسکپ نوری، الکترونی روبشی و تجزیه شیمیایی از طریق سنجش انرژی پرتو ایکس، نشان دهنده تشکیل رسوبات با ترکیب نیترید آلومینیم در زمینه آلومینیم خالص تجاری بود. این رسوبات توزیع غیریکنواختی در لایه پیدا کردند. کاهش اندازه دانه زمینه آلومینیمی از 100 میکرومتر تا 70 میکرومتر در اثر فرآیندهای ترمیم ناشی از تغیرشکل شدید و ارتقای قابل توجه خواص سطحی در حالی است که درصد حجمی ذرات کامپوزیتی بسیار کم است. لایه‌های سطحی با توجه به انجام عملیات ترمو مکانیکی شدید به دانه بندی ریزتر و مقادیر بالایی از سختی رسیدند. در نتیجه اندازه دانه‌ها از میانگین 100 میکرومتر به 70 میکرومتر و از سختی پایه 22 ویکرز به حداکثر 38 ویکرز رسید که این در حدود 7/1 برابر سختی پایه است. مقاومت سایشی نمونه هم با توجه به ریزدانه شدن سطح و حضور ذرات سخت نیتریدی تا 1/1 برابر زیر لایه آلومینیمی بهبود یافت. ضریب اصطکاک سطح از 2/1 به 9/0 رسید که این خود نشان دهنده بهبود خواص سایشی نمونه است. 1. Metals Handbook, Non-Ferrous Alloys, Vol.2, ASM, 9th ed., Ohio, 1988, pp.588-591. 2. T. W. Clyne and P. J. Withers, An Introduction to Metal Marix Composites", Cambridge University Press, (1993). 3. N. Chawla and K. K. Chawla, Metal matrix composites, Springer Science & Business, Media, Inc., (2006). 4. Y. S. Tian, C. Z. Chen, D. Y. Wang, Q. H. Huo and T. Q. Lei, Laser surface alloying of pure titanium with TiN-B-Si-Ni mixed powders, Applied Surface Science, 250(2005)223 -227. 5. M. E. Smagorinski, P. G. Tsantrizos, S. Grenier, A. Cavasin, T. Brzezinski and G. Kim, The properties and microstructure of Al-based composites reinforced with ceramic particles, Materials Science and Engineering A, 244 (1998) 86–90. 6. E. Sicard, C. Boulmer-Leborgne and T. Sauvage, Excimer laser induced surface nitriding of aluminium alloy, Applied Surface Science, 127(1998)726-730. 7. S. Gredelj, A. R. Gerson, S. Kumar and G. P. Cavallaro, Inductively coupled plasma nitriding of aluminium, Applied Surface Science, 199(2002)183-194. 8. Y. Ando, S. Tobe, H. Tahara and T. Yoshikawa, Nitriding of aluminum by using supersonic expanding plasma jets, Vacuum, 65(2002)403-408. 9. M. Quast, P. Mayr and H. R. Stock, Plasma monitoring of plasma-assisted nitriding of aluminium alloys, Surface and Coatings Technology, 120(1999)244-249. 10. H. Y. Chen, H. R. Stock, P. Mayr, Plasma-assisted nitriding of aluminium", Surface and Coatings Technology, 64(1994)139-147. 11. D. F. Lii, J. L. Huang and S. T. Chang, The mechanical properties of AlN/Al composites manufactured by squeeze casting, European Ceramic Society, 22(2002)253–261. 12. S. Swaminathan, B. Srinivasa Rao and V. Jayaram, The production of AlN-rich matrix composites by the reactive infiltration of Al alloys in nitrogen", Acta Materialia, 50(2002)3093–3104. 13. R. S. Mishra, M. W. Mahoney, S. X. McFadden, N. A. Mara and A. K. Mukherjee, High strain rate superplasticity in a friction stir processed 7075 Al alloy, Scripta Materialia, 42(2000)163-168. 14. C. J. Hsu, P. W. Kao and N. J. Ho, Ultra fine-grained Al-Al2Cu composite produced in situ by friction stir processing", Scripta Materialia, 53(2005)341-345. 15. A. Shafiei-Zarghani, S. F. Kashani-Bozorg and A. Zarei-Hanzaki, Microstructures and mechanical properties of Al/Al2O3 surface nano-composite layer produced by friction stir processing, Materials Science and Engineering A, 500(2009)84–91. 16. R. S. Mishra and Z. Y. Ma, Friction stir welding and processing, Materials Science and Engineering R, 50(2005)1-78. 17. G. J. Fernandez and L. E. Murr, Characterization of tool wear and weld optimization in the friction stir welding of cast aluminum 359+20%SiC metal-matrix composite, Materials Characterization, 52(2004)65-75. 18. S. F. Kashani-Bozorg, K. Jazayeri, Formation of Al/B4C Surface Nano-composite Layers on 7075 Al Alloy, Advances in Natural Sciences: Nanoscience and Nanotechnology, 1136(2009)715-719. 19. A. Shamsipur, S. F. Kashani-Bozorg and A. Zarei-Hanzaki, Production of in-situ hard Ti/TiN composite surface layers on CP-Ti using reactive friction stir processing under nitrogen environment, Surface and Coatings Technology, 218(2013)62-70. 20. B. X. Liu, X. Zhou and H. D. Li, Thermodynamics and growth kinetical consideration of metal‐nitride formation by nitrogen implantation, Physica Status Solidi (a), 113(1989)11-22. 21. حسین اسکندری، "رفتار تریبولوژیکی کامپوزیت‌های زمینه آلومینیمی ذره‌ای تولید شده به روش فشردن انفجاری"، دانشگاه تهران، رساله دکتری، )1384(. 22. A. Shamsipur, S. F. Kashani-Bozorg and A. Zarei-Hanzaki, The effects of friction-stir process parameters on the fabrication of Ti/SiC nano-composite surface layer, Surface and Coatings Technology, 206(2011) 1372-1381. 23. A. Shamsipur, M. S. Pezeshki, S. A. Behmand and M. Rezaei, Improvement in surface specifications of AZ31B magnesium alloy by friction stir processing under nitrogen environment, 6(2018) 1-10. 24. A. Shamsipur, S. F. Kashani-Bozorg and A. Zarei-Hanzaki, Surface Modification of Titanium by Producing Ti/TiN Surface Composite Layers via FSP, Acta Metallurgica Sinica (English Letters), 30(2017) 550-557.